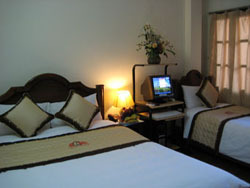 Opening on Sep 8, 2006 the Sunshine 2 hotel, located in center of Hanoi Old Quarter - next to Handspan Travel, has become popular very quickly because of the high quality of service. 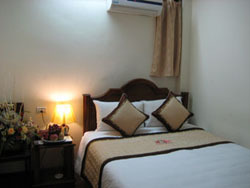 The rooms are well equiped with air-conditioner, private bathroom with hairdryer, hot water, IDD telephone, refrigerator, free ADSL internet connection, cable TV, decorated appealingly, queen size bed and twin bed. Computers are also available in suite rooms. The Sunshine restaurant serves 3 meals daily with Vietnamese and Western food. You can book airplane ticktets, train tickets, bus tickets and tours to any part of Vietnam in our Travel desk. Our friendly and helpfull staff will make your stay comfortable and unforgetable. A minimum of 72 hours' notice is required by this property for cancellations or changes. Cancellations or changes made within 72 hours of the check in time forfeit the full amount of the booking. 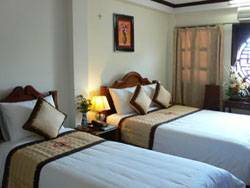 Centrally located in the heart of Hanoi's historic Old Quarter, the Sunshine 2 Hotel offers you peace and comfort amidst the hustle and bustle of Vietnam's capital city. 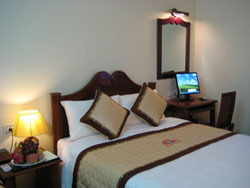 It takes 5 minutes walking from Hoan Kiem lake and a 45 minutes drive from Noi Bai International Airport. 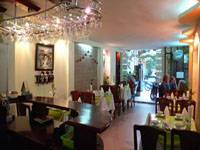 The area is known as the tourist centre of Hanoi and is therefore extremely convenient for visiting all the surrounding tourist attractions and shopping areas. Pick up service is available for $12/car. Please let us know your flight number and arrival time.